Happy Together Weddings, Sky River Helicopters, Bounce A Lot Inflatables and 3rd Eye Open NYC Psychic showcase their expertise on the world's largest party, wedding and event planning online network, PartyPOP.com. 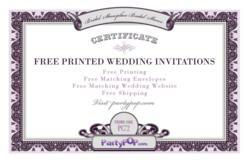 Many Partypop Vendors are Giving out Certificates for Free Printed Wedding Invitations. PartyPOP.com features some of the most sought after party, wedding and event professionals. PartyPOP.com recently made headlines by offering truly free wedding invitations to every bride and groom in the USA, Canada and U.K. The company's website features more than 2 million party, wedding and event planning professionals and is expanding daily as vendors list their business on the network. They include a diverse set of experts, such as Reverend John, a wedding officiant from Happy Together Weddings. As a wedding minister, he provides wedding vows if needed, or lets the couple share their own personalized vows. He resides in Long Island, but since he is fully licensed in the entire tri-state area, he can travel anywhere to fit the couple’s needs. He assures that wedding services will be held professionally and according to the couple’s standards. Reverend John can be contacted online at http://www.partypop.com/v/4261020. Sky River™ Helicopters offers a variety of services: Helicopter tours, VIP charter services, demo rides, pilot training, aerial photography and aerial surveys. They have two convenient locations in New Jersey, each providing the same services. Customers can enjoy touring the spectacular skyline of New York City at 1500 feet above the ground. Others choose to cruise along the Delaware River, to fly over the scenic Poconos, or to photograph their own house and town from an aerial perspective. Sky River™ Helicopters can be found online at http://www.partypop.com/v/4344282. Bounce A Lot Inflatables has a tagline that is popular amongst parents: “We make kids tired… and parents happy!” The company stands for reliability, experience, professionalism and value. Bounce A Lot Inflatables offers 50+ units and has been in business since 1993, serving the Tampa Bay Area. They carry 2 million dollars in liability insurance and can go to any park, school, or athletic field in all of Florida. After every rental, all of the equipment is completely cleaned, sanitized and well maintained. The company is an approved vendor for Hillsborough County, Pasco and Pinellas County Schools. They also work with local YMCA’s and many churches in the greater Tampa Bay area. Customers can rent bouncers, slides, moonwalks, combos, and games for fun birthday parties. Bounce A Lot Inflatables can be found online at http://www.partypop.com/v/1446263. Melissa Stamps from 3rd Eye Open NYC Psychic is a Certified Intuitive Counselor, Medium and Clairvoyant. She has had Clairvoyant and Clairsentient talents since she was a kid. She can see, hear and sense emotions and events in many dimensions. She is passionate about helping people live their lives fully, creatively and abundantly. Currently she is located in Northern New Jersey. Melissa says: “The process of transformation is an adventure” and she is dedicated to playing a role in people's success. Melissa Stamps can be found online at http://www.partypop.com/v/4277364. PartyPOP provides every bride and groom across the USA, Canada and the U.K. with free beautifully designed wedding invitations, printed on 80lbs card stock paper with matching envelopes and wedding website. Even door to door shipping is at no cost. There are no hidden fees, no obligations to buy and no strings attached!